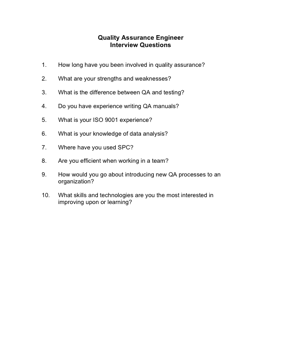 Choose your next Quality Assurance Engineer with the aid of these helpful interview questions. 1. How long have you been involved in quality assurance? 3. What is the difference between QA and testing? 4. Do you have experience writing QA manuals? 5. What is your ISO 9001 experience? 6. What is your knowledge of data analysis? 7. Where have you used SPC? 8. Are you efficient when working in a team? 9. How would you go about introducing new QA processes to an organization?